The first thing I do usually when I wake each morning here in South Dakota, is look out one of our east facing windows. I think I have just about always done the same wherever I have lived, I love the morning sun and the promise of each new day. But for reasons I am about to share, the sunrise here is just different, and I appreciate each and every one I am able to enjoy. The past 15 years of my life in Madison, WI there were typically neighbors homes or trees blocking the view and the sound of cars whipping by a busy road accompanying any morning light. My time in Montana is perhaps the best comparison. As you can imagine, there were magnificent views in each direction and a bold skyline of snow capped mountains, rich green forests, clear ice blue rivers, and deep shadows in the valleys, all soaking up the sun as it would rise in the sky. But the sunrise would come in beautiful stages. Here, it is instant it seems, the first crack of light is far and wide, like a fire spreading across the horizon. It is sincerely unlike any other I have ever experienced simply because, if for no other reason, there is nothing to block your view (well, maybe the power lines) as far as the eye can see. While this morning once again did not disappoint – 6:45 a.m., deep shades of pink, orange, yellow and bright blue were mingling together across the horizon – there was one thing blocking the view. At least through one window. 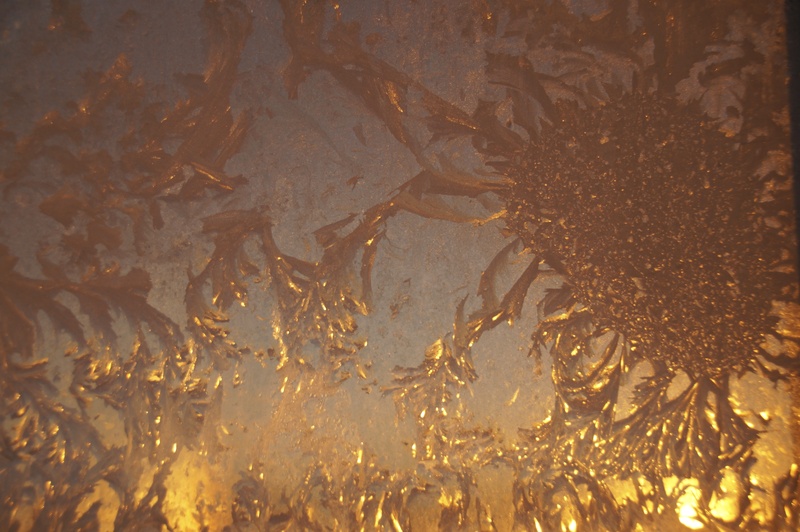 While I know the sheer amount of frost here is not good for the wood frames and a clear indication we need new windows/better insulation/etc (a project we plan to tackle in coming months) I tried to ignore that for the time being and soak in the moment. 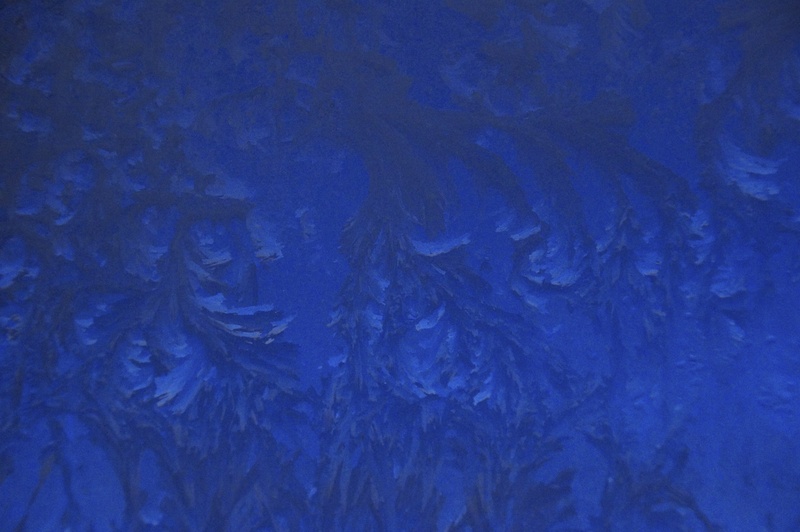 The pattern of the frost was a bit mesmerizing and I loved the first light of dawn shining through. 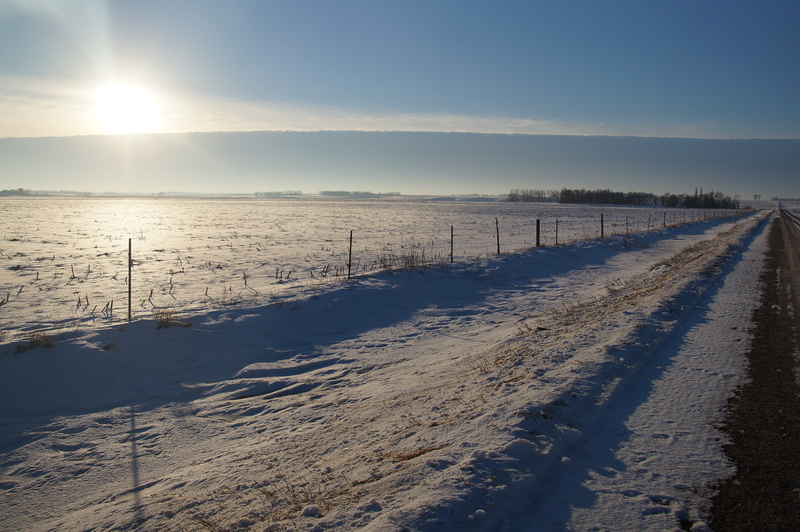 This entry was posted in Cowboy, Great Plains, Photography, South Dakota, Sunrise, Uncategorized, Weather, Wisconsin and tagged Great plains, Heavy winter frost, Madison, Mountains of Montana, Need insulation, New windows, South Dakota, Sunrise by Carleen Wild. Bookmark the permalink. This is all sorts of beautiful – reminds me why I put up with winter every year 😉 Thank you so much for sharing! Hey, Jessy! Great to hear from you and sounds like things are a bit frost filled but wonderful in your wintry corner of this earth as well. Thanks for checking in! Let me know a it more about it before I click on the link? Sorry, too many web viruses out there and want to be sure it’s a legit site/ask? Thanks.